I took this last month. OOh! It's so skinky! Nice. 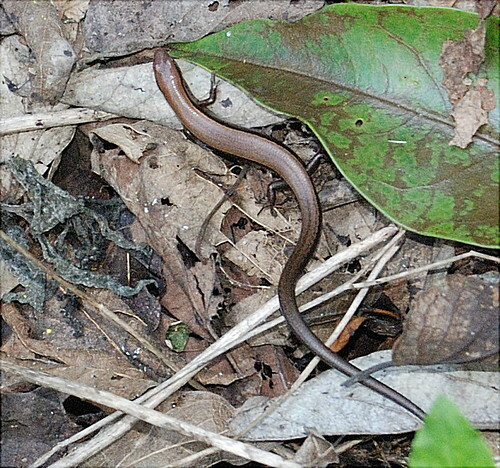 It's a skink which is a kind of lizard. They look like a large version of the salamanders we have in Connecticut, but they live on land. I guess St. Patrick saw how cool skinks were and decided to let them be. Skinks are very fast and hard to photograph. So I was happy that this shot came out. What's interesting is that e_moon60 got a good skink picture about the same time I did. It makes me wonder if that's a time of year skinks are slow for some reason. Elizabeth (e_moon60) has an amazing photo gallery of critters she's photographed on her land and then identified. Check out http://pics.livejournal.com/e_moon60/. She documents the critters on the land as a part of the prairie land restoration work she's doing on her 80 acres. Both the pictures and the project are very impressive. ndozo knows much more about skinks than I do. They both slither, but only city skanks are slimy. Snakes are actually a type of lizard who have lost their legs. Sort of like whales being relatives of the hippopotamus without the attitude. (I didn't make up either of those theories but I could have). It is a great shot. The green really accents how cryptic the skink is against the dead leaf litter. I'd like to claim I planned the shot and got the skink pose exactly how i wanted, but it's a total Hail Mary shot. The only other picture I took before it disappeared has a tail shaped blur in it. Skinks are fast!